Bring a touch of Africa to your yard with the brilliant orange Ornithogalum dubium. 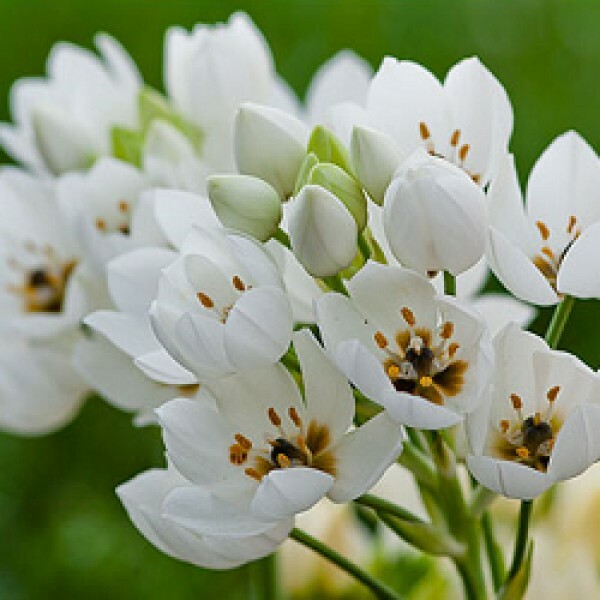 Commonly called star of Bethlehem, orange star flower, snake flower or chincherinchee, this South African bulb is hardy in U.S. Department of Agriculture planting zones 7 through 11, and can be enjoyed as a tender bulb or a potted plant elsewhere. The plant grows up to a foot tall and blooms with clusters of 15 to 20 small six-petaled blossoms on 12 to 15-inch stems in spring. Orange star flower makes an attractive rock garden or woodland plant where they can naturalize in a site that receives full sun. Ensure the orange star is in soil that drains well. The bulb can rot if it stays wet in its winter dormant season. A raised bed, rock garden or sandy soil work best when the plant grows outdoors permanently. Otherwise, lift the bulbs at the end of each season and replant them in the spring, or grow the plant in a pot, which can be stored out of rainy weather over the dormant season. Store lifted bulbs in a mesh bag in a dry, airy environment. Amend soil with compost at planting time in the spring. Bulbs should be buried 3 inches deep and 3 to 6 inches apart for best performance. No Matches Found. Please try your search again. Water the plant so it is moist, but not soggy during the growing season. Feel the soil with your fingers to ensure it is not too wet before watering. Monitor the plant for signs of thrip infestation during the growing season.Thrips often feed on closed buds and leaves or the undersides of leaves, leaving distorted or discolored leaves and blossoms, and a sprinkling of telltale tiny black dots -- the droppings of the tiny winged insects. Spray the plant with a strong stream of water to dislodge thrips, and prune away and dispose of any infested plant parts. Keep weeds that can harbor thrips away from the plant as well. Eliminate any leaves or foliage that show signs of rusty brown spots. This is a fungal disease that orange star flowers can contract. Keep plant litter picked up from around the plant to avoid harboring any fungi. Apply a fungicide approved for ornamental plants in severe infestations. Remove spent flowers as they die back, pulling the spike from the plant once all flowers have faded. Apply a water-soluble all-purpose ornamental plant fertilizer around the base of the plants when it has completed flowering. Prune off foliage to the ground only after it has yellowed. Until that point, it still is taking in energy for next season's growth. Dig up the bulbs and separate offsets to replant in new locations every few years or when blooming or the general health of the plant decreases.